The Soup Spoon ultimately makes soups and grooms leaders. We want to help uncover the dynamic talents that may be latent within, and equip you with the management skills that can propel you to the next stage of growth. Management certification includes learning the finer art of leadership, planning, organizing, analyzing and developing effective brainstorming skills. Each trainee is also given a month to run an outlet independently. Thereafter, the management trainee will be given the opportunity to present their future plans for their outlets. So if you’re seeking an exhilarating career in the F&B industry, The Soup Spoon is exactly what you are looking for! You are the brand ambassador of The Soup Spoon! 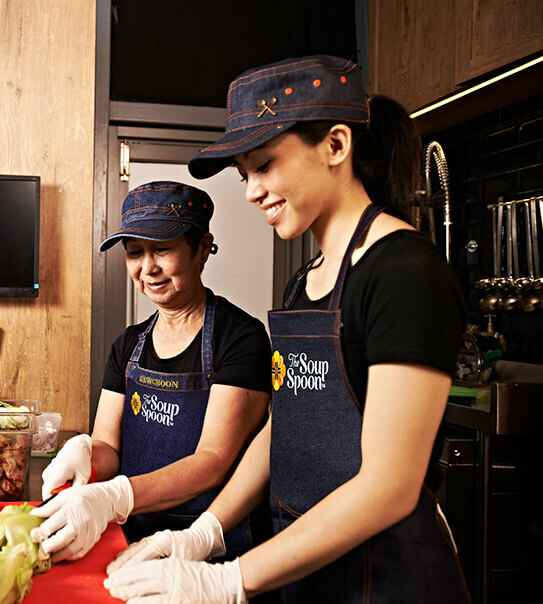 You contribute greatly to our success by leading a team of retail staff to serve good wholesome food to our customers. You inspire, supervise and direct the workforce, make staff decisions and ensure customer satisfaction and product quality. You also manage the store’s financial performance as well as safety and security within the store. You will be our key personnel in leading a team towards achieving sales targets and service excellence. We love to promote from within! So should you display exceptional potential in leading and managing, we will love to provide you with the opportunities to advance to greater and more rewarding roles within the company. You are our champion for The Soup Spoon’s “Customer Promise”! You help us ensure that this “Customer Promise” is consistently fulfilled, quality store operations scrupulously maintained and staff (in particular the service crew) well led and empowered. You are customer-oriented with strong organizational, communication and people development skills, overseeing the coordination and execution of all orders during operation hours. You also delegate work among staff and manage the team. Your strengths are thinking independently, possessing sound judgement and having the ability to make reasonable discretion in day-to-day performance of job duties. You are the backbone of the operations, ensuring that the food we prepare and serve is in pristine freshness. You see to it that food items are prepared upon customers’ orders. You perform simple paperwork and ensure that all kitchen equipment and general work areas are cleaned and maintained. As the most senior in the kitchen, you will be responsible for the staff in each shift. You oversee the entire backend kitchen operations of each outlet and ensure that there is an efficient process of preparing and serving food. You are the face, the smile, the host in The Soup Spoon! This role is a great way to begin a Food and Beverage career as you gain first-hand knowledge of how the industry works. As the customers’ first point of contact, you are vibrant, friendly and assertive, possessing excellent interpersonal and customer service skills. As a crew you will perform all duties associated with the role and see to it that company policies are implemented and maintained. You must be able to work shifts.